The Earth has 7 Lagrange points nearby since SEL1 and SEL2 (Sun-Earth Lagrange points 1 and 2, respectively) are only between 3 and 5 LD (lunar distances) away from the five EML (Earth-Moon Lagrange) points. Can it be useful for spacecraft to move in a sequence between SEL's and EML's in order to lower their missions' delta-v requirements? Has it been done already? I would think that the monthly and substantial variation in their relative distances and angles should help lower delta-v for a wide range of maneuvers in this wider cislunar region. The SEL1-to-EML2 distance varies between 1,100,000 km and 1,900,000 km over a fortnight, while the EML points always have stationary locations relative to each other. But my impression is that SEL1-EML connections are rarely discussed. Can it be useful for spacecraft to move in a sequence between SEL's and EML's in order to lower their missions' delta-v requirements? Has it been done already? Yes and yes. You are asking about weak stability boundary trajectories. These offer a significantly reduced delta V trajectory from the Earth to the Moon compared to a direct transfer. Two downsides compared to direct transfer are much longer transit times and rather narrow launch windows. That is exactly how Japan's HITEN and NASA's GRAIL satellites went to the Moon. Those satellites used a weak stability boundary trajectory to significantly reduce delta V requirements. 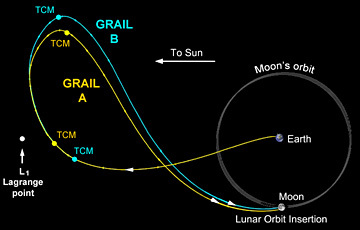 The GRAIL satellites went indirectly from the Earth to lunar orbit via the Sun-Earth L1 point. Not the answer you're looking for? Browse other questions tagged orbital-mechanics orbital-maneuver lagrangian-points cislunar or ask your own question. How does orbital eccentricity affect positions of Lagrange points $L_4$ and $L_5$? Are there any (Lagrange) points in the Solar System in perpetual shade? Are there really just 5 Lagrange points? How Many Martian Lagrange points are there? …And are they useful for satellites?